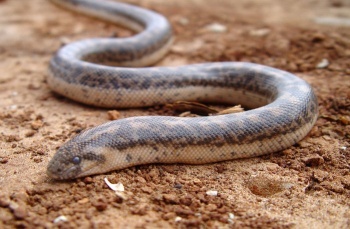 A once-lost species of snake, used by ancient Greeks as a projectile weapon, has been recently re-discovered on Sicily. Now, let's get one thing out of the way. The real story here is that a species of snake, once thought lost in most parts of the world, has re-appeared. That's great, it really is. Hooray for biodiversity! That being said, let's sit back and ponder the Javelin sand boa's place in history: the ancient Greeks used them as projectile weapons, hurling them onto enemy boats in order to sow confusion and panic before boarding. I am going to go out on a limb (sorry, snakes) and guess that the animal's name is not coincidence. As the reptiles proved to be an effective weapon, the Greeks brought these snakes with them to places they settled, including what is now Sicily. Talk about an invasive species. Right? Sorry. Now, Microsoft is still publishing expansions for Age of Empires II. Surely we can get some snake-based naval warfare technology in the next expansion, right? Even better: an FPS set in the classical era where you are armed with nothing but a boa & arrow!